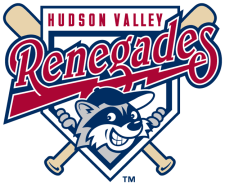 The Hudson Valley Renegades suffered a 5-0 shut-out loss at the hands of the Aberdeen Iron Birds on Friday night at Dutchess Stadium. The Renegades offense struggled, only reaching base four time with only one of them being as the result of a hit. Aberdeen scored first in the fourth inning. Jeremy Nowak reached on a single to center to get things started. Zach Moore cleared the bases with a two run home run to give them a 2-0 lead. Aberdeen added to their total in the fifth inning courtesy of another long ball. This time it was a three run homer by Adam Gaylord to give the Iron Birds a 5-0 victory. Omar Bencomo suffered the loss, allowing 5 runs (4 earned) on 7 hits with 4 strikeouts and a walk in 5 innings pitched. Kyle Ayers pitched 2 shut-out innings with a hit, strikeout and a walk. Adam Liberatore pitched the final two inning, not allowing a hit while striking out 3 and walking 1. The Renegades and Iron Birds face off again on Saturday night at Dutchess Stadium. Devin Fuller (0-1, 4.30) will get the ball for Hudson Valley against Tyler Sexton (0-1, 6.10) for Aberdeen.